Hardware wallet are one of the most secure way to handle your cryptocurrency like bitcoin. The trezor is a hardware bitcoin and other cryptocurrency wallet made by satoshilabs used to secure online transactions. The security reside in the fact that the private key used to sign a transaction never leave the device. 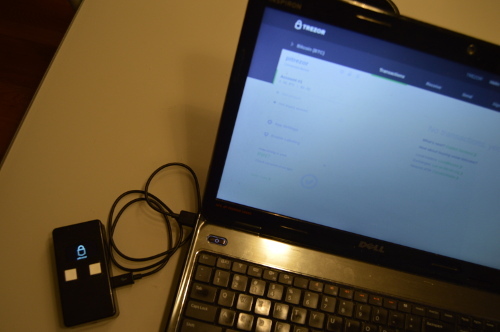 The hardware wallet device connect via USB to a host computer. Any transaction that would imply sending money to someone must be signed to be considered valid by the cryptocurrency network, like the bitcoin network. To perform that, the transaction is sent to the hardware wallet device via USB. The user can confirm its authenticity on the device display and press a button on the device to sign it with the internal private key. The hardware wallet device will send back the signed transaction to the computer to be broadcasted to the internet. In this process, the private key is never accessed by the computer. On the other hand, the raspberry pi zero is a low cost and small but powerful computer. You can buy one for about 5$. It is used on numerous projects by ton of developers and hobbyists around the world. In this web page I will show you how to create your own hardware bitcoin wallet based on the original trezor source code and run on it on a raspberry pi zero. This is a fun, low cost, D.I.Y. project for any cryptocurrency enthusiasm! Now support WebUSB. I updated the usb driver. That mean no more bridge to install if (still beta) wallet is used and the latest version of chrome. Use libSDL2 instead of plain old SDL. That mean it used default hdmi resolution and the 3D engine to scale the output. Code is also more in sync with the original. Renamed TREZOR_SDL_SCALE to TREZOR_OLED_SCALE setting in pitrezor.config file to respect new firmware. Use the original trezor code. Only a thin layer is used to adapt the code to the pi zero Linux platform. All code modifications are open source, like the original trezor code. 100% Compatible with trezor web wallet to perform transactions. Use the hardware random number generator of the raspberry pi for more security. Support small OLED display and/or display via HDMI output. Software is free but donations are accepted! The basic version only needs to connect two push buttons to the pi zero to act as the 2 input buttons of the device. 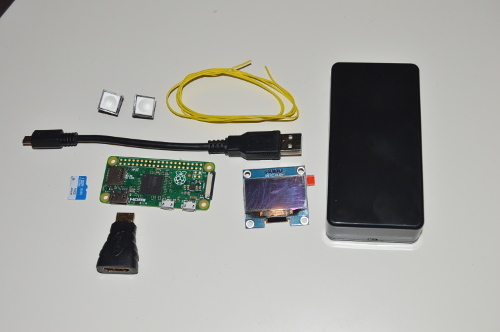 The pi zero as an HDMI connector that is used for output in this configuration. This is a simple solution to start with. Instead of using the HDMI connector, a small OLED display can be attached to the pi zero. In that case, I recommend to use a small plastic box to protect the components and to give a more professional look! It is also possible to use the Adafruit bonnet (see https://www.adafruit.com/product/3531). In that case you just have to install the pins on the pi zero and connect the bonnet! A raspberry pi zero. You don't need the pi zero W, it cost probably a little bit more than the regular pi zero, but it will work anyway. The difference is that pi zero W has wifi and bluetooth but this project don't use it. The network drivers are not loaded by the platform so the W can be considered as secure. An SD card. The image to write on the SD card is very small (around 50 Megs) so virtually any decent SD card should work. Make sure you have one that is compatible with the pi. A good micro-usb to usb cable. A mini HDMI male to HDMI female adapter to verify the output via the HDMI output. You need HDMI cable and a TV or monitor too! Optionally, an I2C or SPI OLED display. Supported OLED are based on the SH1106 controller or Adafruit controller. Optionally, a box or enclosure for a more professional look. Of course, If you are using the Adafruit bonnet, you don't need separate push buttons or OLED. Refer to Adafruit documentation about how to connect the bonnet to the pi zero. If you don't have the software called "etcher" already installed in your computer, download it here : https://etcher.io/ . This software is used to write the program image to the SD card. Start etcher and follow the instructions. You will need to connect the SD card to your computer to flash the pitrezor image file. After the card is flashed, put it in the SD card slot in the pi zero. Connect the HDMI output to a monitor or tv using the cable and adapter. 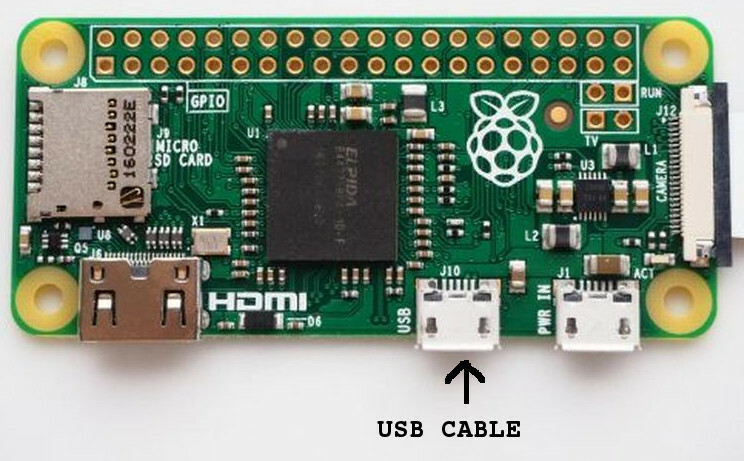 Connect the USB cable in the USB port near the center of the pi zero, not the one near the corner. Refer to next picture. Connect the other end of the USB cable to your computer or a USB power supply. You should see the pi zero boot sequence in the monitor and after 4-5 seconds the trezor logo should appear. Good! That confirms that your pi zero and SD card are working correctly. At this point you cannot do much, so disconnect the USB cable, HDMI adapter and cable and remove SD card. 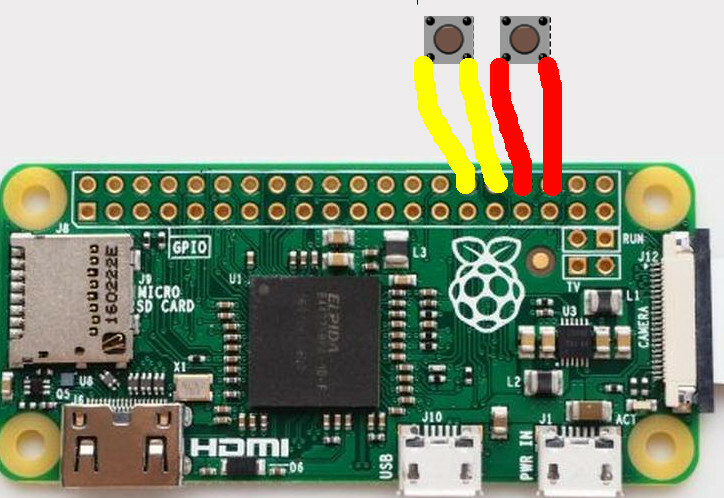 Solder the 2 buttons to the pi zero as showed in the following diagram. The left button (called "no") is connected to the pins 30 and 32 (in yellow in the next picture). The right button (called "yes") is connected to the pins 34 and 36 (in red in the picture). This is the default setup but can be tweaked from configuration file. Put back the SD card in the pi zero and reconnect the HDMI and USB cable back to your computer. You will be requested to install the trezor bridge if you never did it before. Select your operating system to download the correct bridge software and perform installation. If you plan to use the trezor beta wallet, the bridge installation is optional but you must a recent version of chrome. If you don't plan to use the bridge on Linux, don't forget to set the permission accordingly. Refer to setting up chrome on linux. If the bridge is already installed, you should see a message that invites you to connect your trezor. 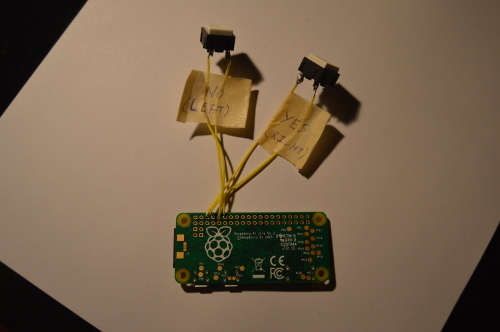 Connect the USB cable of your pi zero. The browser application should detect the device and invite you to perform the trezor setup. During the setup you will need the buttons to, at least, go from one seed word to another. Connect the SD card back to your computer and refer to the configuration section below to correctly configure your OLED model and orientation. Their is only 2 possibles orientations so you can try both and see which one is better for you. Reconnect everything and retry your device. Now you should see the output on the HDMI connector if connected and also on the OLED at the same time. If that work, put everything in a box! Enjoy! And please don't forget to send a donation to continue the support this project update (see below). Any amount is welcome. You can download the latest pitrezor SD card image by clicking here . TREZOR_OLED_SCALE : This control the scale factor of the display to apply when using the HDMI output. A scale factor of 1 means the default size of 128x64 pixel. A scale factor of 2 will stretch the image to 256x128 and so on. TREZOR_OLED_TYPE: Specify the type of OLED connected to the pi zero. The file enumerate the different value and their meaning. Select the one that match your OLED display. TREZOR_OLED_FLIP: Set to 0 or 1 to control the image vertically (normal or inverted) This is useful depending how you assemble the OLED in n enclosure. TREZOR_GPIO_YES and TREZOR_GPIO_NO : Specify the GPIO number to use for the yes/no button. If you soldered the buttons like mentionned in the tutorial, you can keep the default values. When you change a value, keep the line formating as-is with the export statement. Just change the number after the equal sign. If you change something else, this could prevent the pi trezor application to start correctly. The main difference of this device versus the real trezor device is that the pi zero stores everything on the SD card. The equivalent of the flash memory for the trezor is stored in a file on the first partition. That means that anybody that has your SD card can access your seed words and private key. However, the wallet supports the usage of a passphrase. The passphrase is a kind of an extra seed word that is not stored on SD card. By using a passphrase, you would prevent a thief that could have your SD card to empty your wallet. Thus, the recommendation is to always use a passphrase! Flash the SD card with the latest image. Redo the modification you did previously in the pitrezor.config file. Remove the SD card of your computer and install it in the pi zero. Boot your pitrezor as usual. When you will go to the wallet web site, your pitrezor will be detected as a new device. Select the recover option. You will have to enter all the words of your seed word list. Don't forget to enable the pass phrase option after if you were using one before. You should! Scan to send bitcoin donation! A lot of work and effort has been put in this project and still needed to keep it up to date. If you like it, please consider giving a donation. Any amount is welcome! There are inherent dangers in the use of any software available for download on the Internet, and I caution you to make sure that you completely understand the potential risks before downloading any of the software. The Software and SD card image available on this website are provided "as is" without warranty of any kind, either express or implied. Use at your own risk. The use of the software and SD card image downloaded on this site is done at your own discretion and risk and with agreement that you will be solely responsible for any damage to your computer system or loss of data that results from such activities. You are solely responsible for adequate protection and backup of the data and equipment used in connection with any of the software, and I will not be liable for any damages that you may suffer in connection with using, modifying or distributing any of this software. No advice or information, whether oral or written, obtained by you from me or from this website shall create any warranty for the software. any errors in the software obtained from me will be corrected. could include technical or other mistakes, inaccuracies or typographical errors. I may make changes to the software or documentation made available on its web site at any time without prior-notice. may be out of date, and I make no commitment to update such materials. I assume no responsibility for errors or omissions in the software or documentation available from its web site. In no event shall I be liable to you or any third parties for any special, punitive, incidental, indirect or consequential damages of any kind, or any damages whatsoever, including, without limitation, those resulting from loss of use, data or profits, and on any theory of liability, arising out of or in connection with the use of this software. © Yannick Heneault, 2018. Unauthorized use and/or duplication of this material without express and written permission from this blog’s author and owner is strictly prohibited. Excerpts and links may be used, provided that full and clear credit is given to Yannick Heneault with appropriate and specific direction to the original content. Wow this is very good. I will test this once I got the parts. Question: In future, how about updates to the software? Make sure you get the proper oled device. Right now I'm supporting only I2C (not SPI). For the update, I will align my updates on the official firmware release from trezor. Basically you will have 2 options. I will post a page with the details on first update. 1) You simply reflash the sd card. That mean you will lost all your data and will have to reenter your seed words via the wallet application. 2) You backup the emulator.img file in the boot partition on a computer. then you flash the sd card and you move back the emulator.img file. This is an extra manipulation but will save time. No I only have pizero image because only this model can be used as a USB device. On regular pi, you can recompile trezor code in "emulator" mode to play with. You will simply need a keyboard and a screen to interact with it. Is there a way to change the pins that the buttons use? This can be easily changed in the code but will require to recompile pitrezor. I'm about to release a new image, I could make it configurable via the config file if you need this feature. That would be awesome if you can make it configurable via the config file. Would it be possible to add g_mass_storage to use the rest of the sd card? e.g. a third partition that takes up the remaining space and gets mounted as a usb drive when plugged in to devices. Exactly, I think their will be some risk of corruption if not disconnected at the right moment but that would be possible. A bootup script could extend the partition, format it and export it as usb key. Do you have an idea in mind about its usage? well I would like to use it to carry around the browser Plugin for TREZOR and possibly a portable version of a web browser with the trezor wallet site as the homepage. That could probably work. An iso could probably be exported (and kept read only) to avoid security breach from the host computer. Something to look at! i'm using an ssd 1306 1.3" 128x64 OLED display from adafruit. it doesnt power on. is the wiring scheme the same? do i need to install any additional software? thanks. Please let me know if that work correctly. I don't have myself this oled to test but the driver code in the platform should work. The I2C wiring is the same. I only tested using oled with sh1106 controller. Btw, next release will also have SPI interface oled driver code in it. I bridged connections of the back of the OLED on pads SJ1 and Sj2, as mentioned by Adafruit to enable I2C functionality. Is this correct? I can email you screenshots of the wiring if that helps. Thanks. Awesome work with the Bonnets! Would you mind sending some good pic to info@pitrezor.com. I could add it to the blog. I could also provide you a test image with gpio buttons configurable to test it. I don't think you need rst to be connected in i2c mode. Maybe the 3.3v / 5v is the solution. Otherwise, you can probably follow adafruit tutorial to make sure its driver is working correctly. I found some tutorial for the 128x32 at https://learn.adafruit.com/adafruit-pioled-128x32-mini-oled-for-raspberry-pi?view=all to start playing with. Yannick I sent you an email just wondering if you have received it yet? I just answered. You can check your email. If we send you an email how long should we wait for a reply? Are the pitrezor image is not available, links is not works. Trezor update firmware to 1.6.1, how can we update too? I'm in the process of updating the image and documentation. It should be ready in the next few days. Hi Yannick, any good news on 1.6.1? Finally I got the time to update the site! It is there! I am also using the "Adafruit 128x64 OLED Bonnet for Raspberry Pi". (https://www.adafruit.com/product/3531). I change the config file to use the OLED Bonnet. The OLED Bonnet powers up and displays the Lock with the "Go to trezor.io/start" text. I installed the Trezor Bridge but the raspberry pi w does not connect to the Trezor Wallet. The browser application DOES NOT detect the device. Not sure what is the problem..... Any help would be appreciated. Also, is there a way to configure the buttons on the Bonnet OLED screen? Is the usb plugged into the port labeled "usb" on the pi? The next image will support the bonnet as-is, it should be available in the next few days. 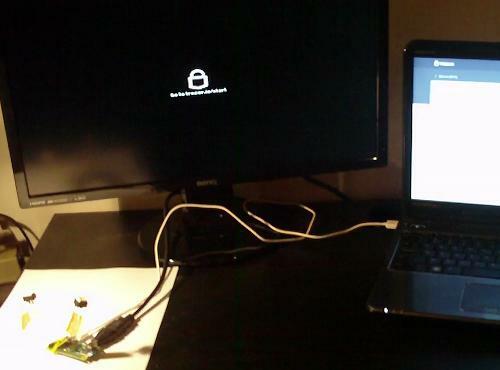 Yes, I plugged the usb cable into the port labeled "usb" on the pi and plugged the other end into the computer. It was not detected by the computer. At one point the computer did say "unrecognized usb", but it was not detected by the Wallet. Cool, cant wait for the new image. Windows in general can be a bit fussy with usb devices. But you still would need to wait until Yannick releases the next image to use the buttons on your Bonnet OLED screen. If it still won't get recognized by windows let me know. Still working on it. I tried another usb port, still doesnt work. I tried a new usb cable, still doesnt work. I will wait for the new image that utilizes the Bonnet OLED. New image is there if you want to give it a shot. Maybe trying on another computer could be something worth to try. Awesome! Thanks. So, I used windows 7 and it took a while to install drivers, but it worked. The raspberry pi finally connected to the computer and connected to the website. The buttons for the OLED Bonnet works too. I'm glad to hear that! Congratulation! Do you have a 3d-model (.stl) file for the closing box? I appreciate if you upload it as well! I don't have the files but that would be awesome if someone could send them to me. For my version I used a standard ABS box and I cut plastic with a dremel cutting disc. My main concern with 3D files would be the buttons. Depending on the type of buttons, the position/size would not be the same. At least, Oled on the other hand are relatively standard. After some research, I'll try to print the following module: https://www.thingiverse.com/thing:1193350 . Though, I agree with the concerns about the buttons. Some things I noticed about it. The usb port opening is not the correct one. It seems to expose the usb power. Also it doesn't seem to have scoket to use screws to maintain the back in place. That is correct! After some modification it works great . I will upload the new stl files in the following week. It would require a touchscreen to be hooked to the Pi Zero. Yes I was thinking of it but the price of a touchscreen color display make me think that this port would be less interesting as a DIY project. Would such one be sufficient ? Can you highlights the modification that you were doing to the trezor's source code ? (For security reasons, and to learn more about how to add new feature to it..). I found it really hard to make a diff with the trezor repo. Great tutorial! I was wondering if I can get some help. I am new to yocto. I am trying to understand yocto and the layers. Why did you created meta-pitrezor layer? 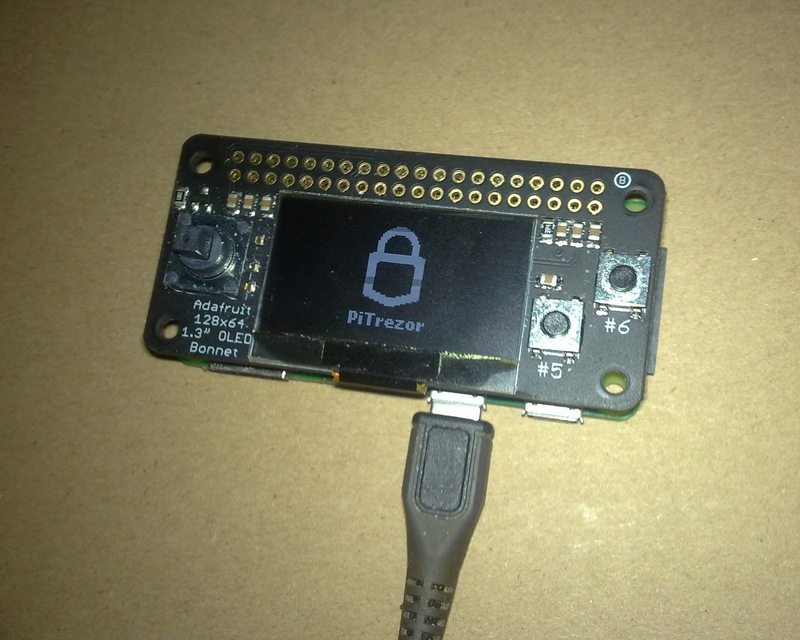 Could you have just built a generic raspberry pi distro and run the trezor code on it? Is that possible? Im just trying to learn and understand. Thanks. The meta-pitrezor layer allow me to add my port of the trezor application as part of yocto build. It also contain the image file that list the applications to install in the image file. This allow me to create a very small distro with only was is required to run. The layer also contains some fixes to other application and some custom configurations to reduce the image footprint. I think yocto was the best choice for this project. Distro for the pi like raspbian contain a lot of softwares not required for pitrezor because they are more desktop oriented. Using a distro like this would have implied to remove or cleanup a lot of packages. With yocto I can select what I want to be installed more granulary. I you have some other questions about yocto, feel free to PM me. Hey, thank you for the tutorial! Unfortunately I'm having some trouble. I can get the device to show the Trezor screen on a TV connected via HDMI, but when I go to the trezor.io/start page, it never gets past asking me to connect my device to start. As a separate issue I can't seem to get the Adafruit Bonnet to work, but I think that's just my own problem with being unfamiliar with it. some things you could try: Check with another usb cable, check with another monitor, check in system manager for the list of usb device connected to see if it is there. You can also try to reflash the sd card with an original Pi distro like raspbian to see if it boot correctly and if you have hdmi output. Hi friends. It's a great project, I've ordered parts and waiting for delivery. But I wanted to inform you that I am a graphic designer and a 3D designer. How will everything be made up at home, I will make a box and a public. If the interest and creator of the PiTrezor project will want, I can present myself as part of this blog. I ordered the Adafruit 128x64 OLED Bonnet. If I get in the Czech Republic, I will make a second modification. (or you can send it to me - I'll pay). Here it is just in the Czech Republic OLED model http://rpishop.cz/displeje/874-adafruit-128x32-pioled.html. WOW! This is awesome. I have a few Pi Zero W units laying around, so I popped in a new 2G MicroSD card and followed your tutorial. I have a couple of cheap Ebay SPI OLED (128x64 .96") also which work perfectly with the following layout. Changed the config file to use #4, with a zoom of 1. The setup on the Trezor site was very easy, and worked perfectly using the buttons also. I have now ordered a non-wifi model of the PiZero dedicated for this purpose. I also have a 3D which I'll have to look at designing a case for this unit now. Something to hang off my car or house keys maybe. Ok, I have made a 3D case for this as a thanks. It fits my unit just fine. Also, the RPI Pin# I quoted yesterday were reversed, sorry. Brain fade. The correct pin names here. Hope you like it, feel free to modify for yourself. Wow impressive! Thank you for sharing the 3D files. I'm sure some people will use them! Thanks Yannick, the update worked fine. Entering the passphrases was simple enough to recover, and no more "Firmware Update requrired" on the trezor page. Appreciate the effort you have done here. Thank you for update version.! thanks for that quick update! Is there a way to see the private keys by looking at the sd card on a pc? Could I enter my own private key on the sd? by dumping the emulator.img file in the sd card you could retrieve the seed words that were used to generate the private keys. This is why you should always use a passphrase. The passphrase is not stored on the sd card and act as an extra word in the conversion from the word seed list to private keys. Have you considered encrypting the SD card with LUKS? Seems this could drastically increase security. Would also be good to limit number PIN tries + auto wipe seed. The protection would be limited. I'm trying to minimize the changes with the original trezor code to avoid to introduce all kinds of possible errors (security, malfunction..) and to keep 100% compatibility with the online wallet. Also, all the code is open source, so anybody could review it and see how encryption is used. 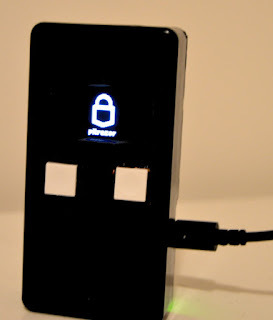 The passphrase could in theory be used to protect the partition that hold the flash image, but, when the online wallet is asking for it when the trezor is connected, the flash image is already loaded by the pitrezor to tell wallet to ask for the password. This is a chicken'n'egg problem. I could solve it by breaking the flash in 2 parts (one encrypted, one not) but that will be a big change from the original code. The pin is not a real protection because it can be extracted from a dump of the flash image. The best protection is the passphrase because it is never stored. For the 'ultra paranoid' security conscious people, couldn't you just add passphrase protection, then remove the SD card from your Pi-Trezor, put it in your "Etcher" application and create a new image, then encrypt the image with say TrueCrypt (yes I know about it's apparent flaws) and store it on a second USB drive somewhere offline, and extract the encrypted image only when needed? This is untested by myself, just theory in my head. Hello there! Thank you for this amazing work. Looking at build-pitrezor.sh I noticed that it is using /dev/random as a source. How safe it is? Shouldn't it use /dev/hwrng instead? LGTM. Thanks for detailed answer. Is there anyway to change the welcome image? Hi there. Yannick, you made a great job! I followed your instructions and made this device. I had no Pi Zero available, only Raspberry Pi Model A+ and 3B, fortunately Pi Model A+ allows similar configuration, but you need USB Type A (Male to Male) cable to connect to PC and replace string in config.txt file on SDcard "dtoverlay=dwc2" to this one "dtoverlay=dwc2,dr_mode=peripheral". Hope this helps someone. Hi. I was unaware the model a+ could work as usb gadget! I will try it. Did you had to add the proper boot files in the boot partition because my image contains only the file for the pizero? Thanks for sharing. I just used precompiled firmware that you provide, because A+ and Zero share the same hardware, no additional boot files needed. Good luck.